St Isidore's encyclopedic knowledge, not always original or accurate, led to his being proclaimed patron saint of the internet ! 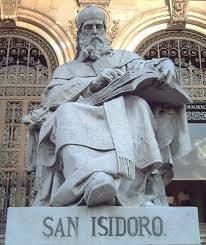 St Isidore of Seville belonged to a strong religious family in 6th century Spain. His encyclopedic knowledge, not always original or accurate, led to his being proclaimed patron saint of the internet. Patrick Duffy tells his story. Isidore’s family came from Cartagena in south eastern Spain, but he was probably born in Seville. His elder brother, Leander, became a great archbishop in Seville and is venerated as a saint as are another brother, Fulgentius, bishop of Ecija, and their sister, Florentina, a distinguished abbess. Leander oversaw Isidore’s education probably in a monastic school and he became the most learned person of his generation and a leading authority on a wide range of subjects through the Middle Ages. Isidore succeeded his brother Leander as bishop in 599. Recared the Visigoth had converted from Arianism to Catholicism and both he and Isidore made significant contributions to the culture of the new Catholic kingdom, especially in the composition of the distinctively Spanish, or what is now called Mozarabic liturgy. 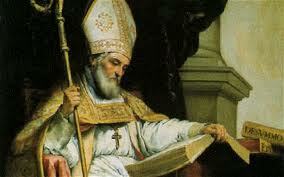 Saint Isidore (560-636) was an incredibly learned man. A compiler of popular knowledge rather than an original thinker, Isidore’s encyclopedic work is called the Etymologies, or Origins, from the number of words whose meaning he explains. Its 20 volumes cover all human knowledge from grammar and mathematics to biology, geography, classical literature and theology. Acute critics point out that not all his explanations are correct. More critically approved today is his History of the Goths, Vandals and Suebi. Isidore also wrote a book of astronomy and natural history entitled De Rerum Natura. It is probably because of his encyclopedic knowledge that he was chosen as the patron of the internet. Isidore died after a careful preparation in 636. It was only when his remains were removed to Leon on the route to Santiago de Compostela that his cult began to grow. In 1598 Pope Clement VIII (Ippolito Aldobrandini) canonised him. In 1722 Pope Innocent XIII (Michelangelo Conti) declared him a doctor of the Church. He was named patron saint of the internet in the mid-2000s.